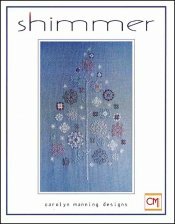 Shimmer [C7196] - $9.50 : Yarn Tree, Your wholesale source for cross stitch supplies. Cross stitch pattern by Carolyn Manning Designs. A tree with snowflakes that shimmer. Stitch count 93 wide x 161 high. Santa's Cabinet: Naughty Or Nice?